Zellen's newest project to press -- released by Stanford University Press on January 22, 2014 -- is Culture, Conflict and Counterinsurgency. You can visit the Amazon page by clicking here. You can visit the book's page at Stanford University Press by clicking here. And you can visit the Barnes and Noble Nook eBook page here. Thomas H. Johnson, Barry Scott Zellen, eds. Culture, Conflict, and Counterinsurgency. Stanford: Stanford University Press, 2014. 304 pp. $45.00 (cloth), ISBN 978-0-8047-8595-2. Reviewed by Peter Mansoor (Ohio State University). Published on H-Diplo (July, 2014). Commissioned by Seth Offenbach. 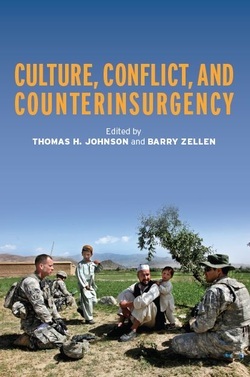 Culture, Conflict, and Counterinsurgency is a collaborative effort by ten scholars and military practitioners to explain the criticality of cultural knowledge and awareness in the messy small wars of the twenty-first century, in particular the ongoing conflict in Afghanistan. The product of a two-year study sponsored by the Naval Postgraduate School in Monterrey, California, this volume seeks to clarify the importance of cultural understanding to national security and foreign policy, the theory underpinning cultural analysis, practical difficulties involved in data collection and analysis, and how cultural issues have impacted recent military adventures in the Middle East and South Asia. Contributors include cultural and social anthropologists, historians, and military officers with both academic and field experience in anthropology and counterinsurgency warfare. The editors conclude that culture matters a great deal in conflict, and the United States and its allies can either make the effort to understand its impact on warfare or suffer the unhappy consequences of their ignorance. They optimistically conclude that Afghanistan can still turn out successful for the United States and its Afghan allies provided they undertake a “significant course change reflecting cultural nuances” (p. 3). Although this assessment may be overly optimistic given the impending departure of U.S. and NATO forces from Afghanistan, this book is highly recommended for scholars, military practitioners, and government officials involved in studying or crafting policies concerning irregular warfare in the twenty-first century. The volume is divided into two general sections, the first focusing on theory and methodology and the second on practice in the context of the war in Afghanistan. The first section will appeal primarily to scholars, although Alexei Gavriel’s chapter on the creation and use of cultural and ethnographic intelligence by military forces will spark both interest among military intelligence professionals and no doubt a great deal of angst among sociologists and anthropologists. Gavriel is undoubtedly correct that military forces must understand the sociocultural underpinnings of the lands in which they operate in order to establish a perception of legitimacy among the inhabitants, but his call to turn this knowledge into formal intelligence fields, complete with the ubiquitous military acronyms, CULINT (cultural intelligence) and ETHINT (ethnographic intelligence), will meet resistance and a great deal of skepticism from the academic community. The other two chapters in this section are perhaps less controversial. Marc Tyrell’s chapter applies Charles Darwin’s theory of natural selection to the evolution of human culture and presents two case studies of how this model might explain contemporary insurgencies. The case study of governance in Mosul in 2006-07 is especially interesting, providing one explanation as to why, when the U.S. invasion destroyed existing governing structures, Iraqis reverted to reliance on family and tribal networks and why efforts to impose a Jeffersonian democracy on them were doomed to fail without some accommodation to the sociocultural realities on the ground. The final chapter in this section, by Steffen Merten, posits the ability of software engineers to create programs capable of fusing “operationally relevant relational and geospatial data” to assist war fighters in understanding their operating environments (p. 77). If successful, such programs (which rely on visual analytics theory and technology) would allow cultural analysts a deeper understanding of tribal and social networks and thereby enhance the capabilities of a counterinsurgency force. The ability of a computer program, however well-constructed, to divine the nuances of tribal and social networks is problematic at best. Merten seems to agree; he wisely provides an important caveat that computer technology is not a replacement for expert analysis underpinned by “linguistic skill, cultural knowledge, and analytical experience” that are key to a full understanding of tribal social systems (p. 91). The discussion of culture and the war in Afghanistan in the second part of the book will be of more interest to the generally informed reader. The first chapter in this section, by Thomas Barfield, is a tour de force of Afghan history, society, and culture and their impact on contemporary Afghan politics. In it we learn (not surprisingly) that the history of Afghanistan did not begin with the U.S. invasion in 2001 and if we are to understand the politics of the nation today, we must begin with tribal and subtribal rivalries of Ghilzai and Durrani Pashtuns dating back centuries, along with the Pakistani government’s complicity in using them to its advantage. The political differences between these groups, Barfield contends, is rooted in the nature of their differing agricultural economies—one subsistence-based, the other supported by irrigation and urban development. The Taliban, led by Mullah Omar (a Ghilzai), opposes a government in Kabul largely dominated by Durranis. Religion lends an interesting element to the struggle, but in Barfield’s assessment it is not the dominant one. Thomas Johnson, in the following chapter on the influence of religious figures on insurgency in southern Afghanistan, disagrees somewhat with Barfield’s assessment. “Islam and Islamic religious figures continue to play a critical role in the everyday life and politics of southern Afghanistan,” Johnson contends (p. 141). In Johnson’s view the failure of U.S. and NATO forces to understand the religious dynamics at play have left them ill-equipped to fight the all-important information battle on which progress in counterinsurgency operations largely rests. Clearly both Barfield and Johnson have explored key social dynamics at work in Afghanistan. The fact is that tribal networks and religion are both fundamental influences on the various parties to the struggle for control of the Afghan people. Feroz Hassan Khan discusses the sociopolitical meaning of the Durand Line, the late nineteenth-century boundary officially separating Afghanistan and Pakistan, but one that native Pashtuns consider nothing more than “a line drawn on water” (p. 150). His discussion of regional dynamics affecting the Pashtun tribal lands delves as much into the political and economic aspects of the situation as it does into the social and cultural issues at play. He presents a decidedly Pakistani view of Indian involvement in Afghanistan as a threat to Pakistani national interests, not surprisingly since Khan served as an officer in the Pakistani Army for thirty years and retired at the rank of brigadier general. Pakistan, he notes, has teetered between integrating Pashtun tribal areas into the state and allowing them a significant degree of autonomy under the aegis of tribal agents. The U.S. invasion of Afghanistan in 2001 allowed Pakistan to attempt (unsuccessfully) the first strategy, which failed in the face of deeply entrenched al-Qaeda and Taliban cadres. As it does not represent ethnic, tribal, or cultural realities, the Durand Line has effectively ceased to exist. The final three chapters, all written by serving military officers, deal with various military aspects of the war in Afghanistan: the role of maneuver companies in counterinsurgency operations at the district level, information operations, and the implementation of a “balanced counterinsurgency strategy” in northeastern Afghanistan in 2007-08. Colonel Michael Fenzel, a decorated combat veteran with two tours in Afghanistan, argues that the most important aspect of counterinsurgency in that country is at the district level along the border with Pakistan, and assets should be reprioritized downward to these districts accordingly. He also advocates the election of district governors by local shura councils, but fails to point out that Afghan president Hamid Karzai has stubbornly resisted this common-sense political change since these positions are a crucial part of his patronage system of governing (i.e., corruption). Fenzel’s call for a concerted outreach to all of the subtribes in each of the nearly four hundred districts in Afghanistan is nothing if not ambitious. The strengthening of counterinsurgency efforts at the district level makes sense provided the assets are available to do so. But therein lies the rub; it is unlikely that the number of maneuver companies and reconstruction assets required to make this plan succeed was ever available even during the heady days of the surge in 2010 and 2011, much less in the current era of U.S. and NATO troop withdrawals. Robert Bebber, a U.S. Navy information warfare officer, offers a survey-based assessment tool developed by his team in Khost province that commanders can use to determine whether their information operations efforts are succeeding in influencing the insurgents and local population. The final substantive chapter, by Nathan Springer, details the population-centric counterinsurgency approach developed by Lt. Col. Chris Kolenda and his unit in Konar and Nuristan provinces in 2007-08. The most important aspect, Springer contends, is the initial assessment of the insurgency and its sources of support, which helps the commander to determine what type of approaches to use in combating it. He details the advances made by Kolenda’s unit using a population-centric approach focused on gaining the trust and confidence of tribal and village elders, one heavy on relationships and development assistance, with the mailed fist of kinetic operations kept inside a velvet glove. He also offers an admonition for the future. “As we draw closer to the end of the war in Afghanistan,” Springer writes, “COIN [counterinsurgency] is becoming a subject of derision. I find that unfortunate. We cannot talk the successes of this approach out of existence” (p. 218). The editors likewise conclude, “In the history of recent counterinsurgency efforts, the impact of cultural understanding on military operations cannot be underestimated” (p. 252). Perhaps the impact cannot be underestimated, but it can be ignored. There are a number of military officers and self-appointed counterinsurgency pundits who are trying to do just that in their quest to return the focus of the U.S. military to fighting state-on-state wars. As U.S. forces withdraw from the conflicts spawned by the terrorist attack on the United States on September 11, 2001, Americans and their military leaders seem united by a common desire to forgo any more of these messy, troop-intensive counterinsurgency conflicts. Unfortunately, in our haste to forget the history of the past decade-plus of warfare in the Middle East and South Asia, we may also jettison the very lessons—among them the importance of culture in determining the outcome of these conflicts—that may help future generations avoid the pitfalls that plagued too many U.S.-led military operations in the past. The editors and contributors to this volume make a convincing case that culture matters a great deal in the outcome of insurgencies and counterinsurgency warfare. Although this book has probably come too late to change the outcome of the conflict in Afghanistan, perhaps it is timely enough to educate the next generation of military leaders, who most certainly will see this type of war again.